This post is about my first virtual lunch with virtual friends whose names start with @, and although I don't know them-know them...I know them. I joined in on the wonderful idea to "create a BLT with your own spin on it, photograph it, and blog about it". Mine is a BLTea ~ I'm kinda new to the social media scene, twitter schmitter, life in 140 characters or less, but I'm hooked! I'm trying hard to catch up with some of the big guns in the foodie/chef/cooking online world. I have to say, most of the time I've found them to be amazingly intelligent, creative, passionate, and generous with info and time. I'm having a blast and so thrilled to be playing. 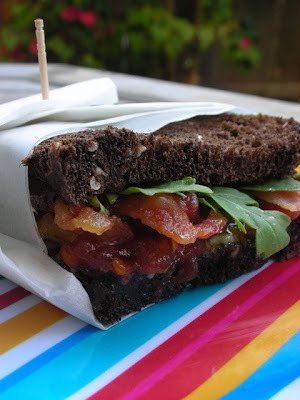 This #BLTlunch idea was one of those twitters that I read between @cowgirlchef and @cheryltan88 and @pinchmysalt. They explained briefly (because that's all you can do on twitter) about doing something that sounded like a virtual picnic, a Friday web-lunch, a Recipe Roundup where BLT sandwiches were the star of the moment. I loved the idea and also knew that it would get me off my canister with the blogging thing. I cook - every day. I think about food - every moment. I take "sorta" good photos - every meal. My family is already so used to eating food that has to be warmed up after it has starred in its own 15 minutes of fame. I wrote to each one of those well established and extremely talented bloggers and said, "count me in". They responded as if we had been friends forever, excited that I was aboard and anxious to see what BLTea was about. Well, my BLTea is about making a Bacon, Lettuce, Tomato sandwich that would be good in all seasons - made with seasonal and farmer's market heritage tomatoes. 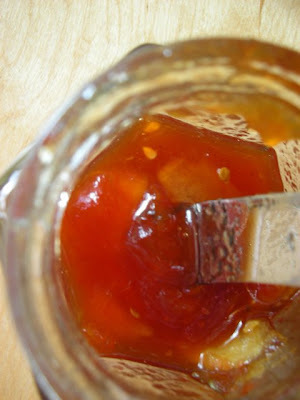 To do that, I turned the tomatoes into a savory, just a bit spicy, jam infused with smokey tea. For about a year now, I've been developing recipes for the very highly respected ALGABAR, a Home and Tea Salon in Los Angeles. I'm Executive Chef for their catering division, Fete Du The, and I've grown to appreciate the healthy, spiritual, sensual qualities of truly great tea-- like the ones they have in the shop on La Brea in Los Angeles. Gail and Robb are more than retailers, they are passionate artists and connoisseurs of taste and style. It's rare to be able to say such great things about people that you work with, and I think of them as friends. But before I throw-up the sandwich I just ate (and loved) with all this mushy talk - let me finish with the bullet points of my BLTea sandwich and I hope you will try making the jam. There is such a self-loving feeling that happens when you spread your own, home-made jam on a piece of bread. You feel - no matter what else - I can survive. I can make jam! Jam on. 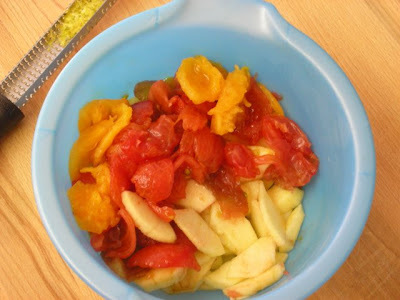 In a deep sauce pan combine the tomatoes, apples, sugar, minced serrano, lemon zest and juice. Heat just to boiling then remove the pan and let cool. Meanwhile, wrap 2 Tbls. 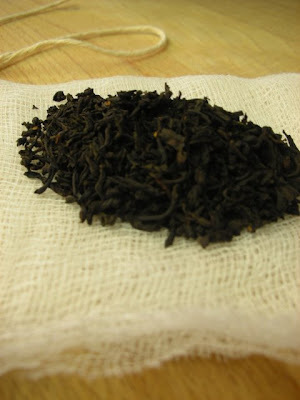 of smokey tea leaves in a cheesecloth and tie tightly with kitchen string. Place the wrapped tea into the pan with tomatoes and push into the liquid. Cover the pan and place in refrigerator over night to infuse. The next day, heat the pan of tomatoes and tea to just before boiling. Remove the wrapped tea and continue boiling the tomato mixture til it reaches 224F. and is concentrated. This should take about 20 minutes. Check the set and carefully pour into prepared jars immediately and seal properly. If not preserving, this can be sealed and kept in refrigerator for 1 week. My BLTea is prepared by spreading the Smokey Tea Jam on one side of dark, multi-grain Russian Rye bread. Add crisp Bacon on top, then wild Rocket Arugula and the second slice of bread. This is a great sandwich for traveling. Let me hear about your jamming, too. Enjoy! You're totally jamming on the BLT -- LOVE this idea. Wonder if I can find a similar tea here in Paris? I have been so swamped with work but this tomato jam idea is making me want to find the time to get to the farmers market - get some fresh colorful tomatoes and make some jam!!!! When you say smokey tea is that like a lapsung suchang? did I even spell that right? I love the idea of tomato jam, but I am completely stumped by "smokey tea". I love loose-leaf tea, but have never encountered this variety. I guess I need to keep my eyes open for it, because it sounds awesome!